One of the key concepts of Tempest is that everybody begins the game with the same resources and builds their deck during the game. Like a 4X strategy game (explore, expand, exploit, exterminate), resources must be split between building up forces for deployment and researching more powerful forces for later in the game. Do you fund science/faith or military? Build too many cards to play now and you may be overwhelmed if your opponent survives your initial rush; build too few and you may find your temples overrun while your worshippers worry about which project to fund next. This is a concept that will be familiar to players of deckbuilding games like Dominion or Ascension, and players of Star Realms will be even more familiar with the dilemma between attacking and buying better cards for later turns. Recently, I have been playing around with different ways for players to invest in cards. In Tempest, players choose four “Shards” before play to construct their decks. Those are: Deity, Temple, Battleground and Neutral, and each comes with cards to differentiate the deck. Players draw cards every turn from their Deck, then discard some of those cards to gain resources to play other cards. On an average turn, they will find themselves with 3-6 resources. Some players invest heavily in researching new cards, others invest more in building cards to play. In the current version of the game, the Deity, Temple and Battleground Shard each comes with 12 cards. These 36 cards become the “Research” pile. Five are revealed each turn and can be purchased. Those that do not get purchased go to the “Unmade” pile and are effectively removed from the game. Example: In the original version, Adam decides to spend 3 aether on Researching cards. He places 1 of that aether on a Geatish Man-at-Arms and 2 of that aether on a Rosahringur Minni Rune. Because the Man-at-Arms costs 1, Adam gains that card to his Discard and can use it on later turns. Because the Rosahringur Minni Rune costs 3, Adam does not gain it this turn, but only needs to invest another 1 aether to gain it in a later turn. Options: Buying cards that you want mid-play lets players direct their strategy and adapt it to their opponent. Colourful and Varied: Lots of different cards come up every game, with new strategies, abilities and art. Risk: Because cards cycle each turn, there is a certain amount of rationing leading to a lot of nail-biting decisions. A card you really need to research might show up on the same turn as a card you really want to play. First Player: Checking the cost of the highest card first drawn from each player’s Research is an easy way to determine first player. Time: It takes a lot of time to empty and refill the Research Row each turn. By the end of the game, after players have the cards they want, many are ignoring this phase and leaving the Row empty. 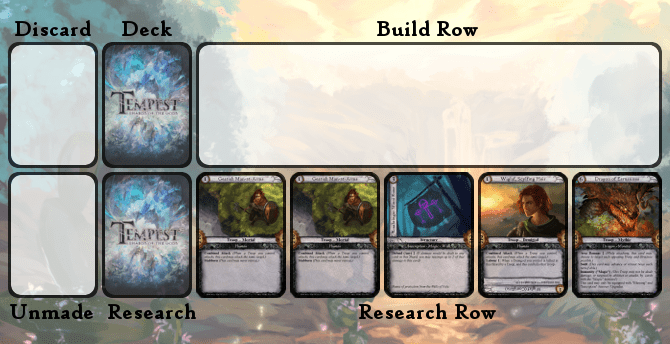 Forgetfulness: The most common mistake for players to make is forgetting to refill the Research Row each turn. Complexity: There is a ton of information to take in. Every turn, players must review five new cards, with all of their associated keywords, abilities and strategies. Players more familiar with the game’s strategies have no problems, but as a casual game, it is a high hurdle. Cost: There is only so much room on every card, so the “cost” of the cards has to be the same to research and build to play. This means every increase in cost is doubled in game, which can be a bit slice of the rationing pie when players only find themselves with 3-6 resources each turn. 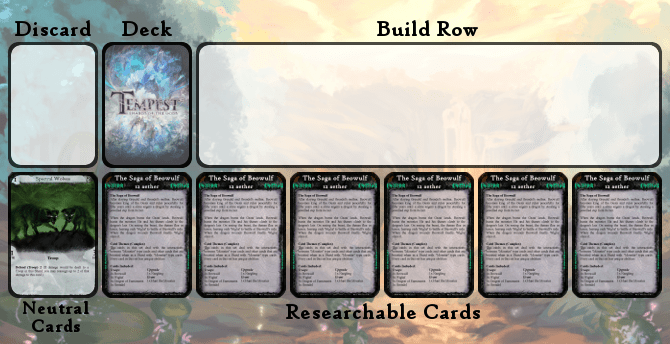 Story and Theme: In the first iteration of Tempest, “Tale” cards were persistent cards that were purchased, placed to the side of the board, and had conditions that had to be completed to give rewards. Those conditions were story-based, but forced players to play the game in specific ways. They were also very complex, where the rest of the game was simple. When I removed them though, a lot of the “theme” of the game disappeared. Cards that had stories associated with them became “just another card”. This game has always meant to be full of story and theme and, while I didn’t want to force players to play in a certain way, I wanted to inform their judgments of a card enough to form a story around that card’s behaviour in game. Cost and Name: Same as with other cards, you can research these cards to gain them throughout the game. Instead of researching cards individually, you research them as a bundle. Story Text: This has a short historical or mythological description of the story behind that Tale (eg End of Days describes the events of Ragnarok). Card Strategy: The six cards associated with each Tale have an overall strategy (eg End of Days has cards that unmake themselves for powerful effects and boosts when cards are unmade). Included Cards: A list of the six cards gained when you research the Tale, grouped by card type (eg End of Days comes with 4x Troops (Einherjar), 1x Structure (Gjallarhorn) and 1x Event (Ragnarok)). Example: In the new version, Adam still has 3 aether to spend on Researching cards. 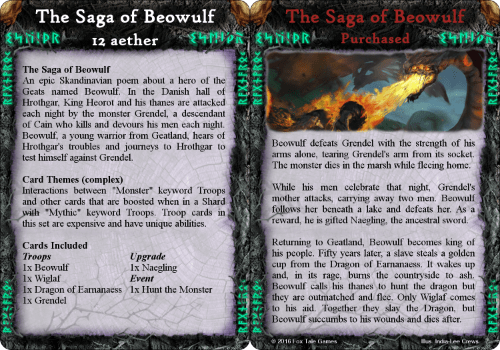 He decides to focus on The Saga of Beowulf Tale card because he likes the sound of Beowulf’s battles and eventual death, and wants the powerful, unique Troop cards that the Tale promises. Adam places all 3 aether on that card. Since the Tale card costs 12, Adam does not gain anything this turn. After a couple of turns, Adam has placed 12 aether on the Tale. He takes the six cards that are underneath The Saga of Beowulf and places them in his Discard pile. He can now use each of them when he draws them on later turns. Options: All six Tales are available from the beginning of the game. Players won’t have to rely on luck to get the combinations they want. Instead, they will be able to invest in the right cards from the very beginning, making the game more strategic and tighter gameplay. Time: Without needing to refresh the Research Row each turn, the end turn phase will be quicker. Forgetfulness: There is no longer anything for players to forget. Complexity: Each Tale card describes a clear strategy, and whether that is simple, intermediate or complex. Players new to the game can rely on simple Tales while more advanced players (and those familiar with deckbuilding games) can research more complex mixtures of strategy. Hopefully this lowers the bar to entry for the game, but keeps it exciting for people to come back. Cost: Cost is no longer linked to the cards you gain. This provides opportunities for interesting mixes of cards without adding to the data needing to be presented on every card. Story and Theme: Since every Tale card has the opportunity to describe something cool about Ancient History and Mythology, players get to learn something about the cards they play, and the game should hopefully feel more thematic. Persistent Tale Abilities: The original (removed) Tales cards had persistent effects that boosted the abilities of the player who achieved them. I’ve always liked this, and these new Tales can also provide persistent ongoing effects once they are researched (maybe boosting starter cards to make them less useless in the late game). However, I foresee a couple of issues in this change. Some of these will have more impact than others, and some I will only know about through testing! Junk Cards: Some Tales will fill the deck with meaningless trash. I am hoping to overcome this with cards that allow players to thin their decks more easily. Colourful and Varied: Not a big issue. Players just won’t have immediate access to all of the cards available. Risk: Balancing the cost of researching these Tale cards will rely on a bit of trial and error to begin with. First Player: Not a big issue issue. There needs to be a new way to choose first player now. I can’t stand when a game has something silly for this, and flipping a coin is annoying. Unmake Ability: Certain cards in the game offer the ability to unmake your own or an opponent’s card. Now that it is impossible to get that card back, it is now much higher stakes when using these cards. It means the benefit of unmaking your own card must be great, and it will need to be much more expensive to use on your opponent’s cards. Insta-win Strategies: This game has a slow pacing, so I must be wary of strategies that are insta-win and guaranteed. This is a bit of an experiment in the game, to see what will work. I will check back in with another designer diary to share how progress is going with it. Thanks for checking in!